Spammy SEO bloggers are jeopardising guest blogging for everyone. Matt Cutts (the head of Google's WebSpam team) declared the end of guest blogging on January 20, 2014. "Okay, I’m calling it: if you’re using guest blogging as a way to gain links in 2014, you should probably stop. Why? Because over time it’s become a more and more spammy practice, and if you’re doing a lot of guest blogging then you’re hanging out with really bad company." Unfortunately for those of us who actively go out of our way to create original and diverse content for readers and consumers, the world of SEO is a virtual land mine. On any particular day the whole game could change, let alone the rules we play it by. And with every new and exciting concept comes the trolling spammers sniffing at your coattails. Now, offering money to acquire links that pass PageRank is a clear violation of Google's quality guidelines, but guidelines are rarely followed by cheaters spammers. It seems some idiot was dim enough to email Cutts offering money for links (really!?) and it seems Cutts feels that the "guest blog" has gone so wayward it's essentially not trusted anymore. It's become a tactic as opposed to a genuine way to share thoughts and knowledge online between content producers. It's a sad realisation for those of us who care about the integrity of our digital info-scape that so often some of the best incentives have the life squeezed out of them all in the name of SERP. We've seen the submission boards on blogs declaring 'Articles submitted for SEO purposes will not be considered' and we've heard the frustration of bloggers whose willingness to consider guest blogging submissions by genuine writers is abused by spammers adding their names to online forums declaring "These guys take guest posts!" We for one say "boo-urns" to you silly spammers while we quietly try to resuscitate the genuine act of "guest blogging". Perhaps moves towards brand journalism and expert contributions will help us find our way. We are actively pursing new and engaging writers to write for our blog and will continue to do the same for our clients; dare we say we'll continue writing for others too. But we won't be scared off by nofollow links. And we'll never buckle to the pressures of spammers. The phrase, "this is why we can't have nice things" has been brandished about in SEO land for quite some time. Matt Cutts definitely wasn't the first to use it and he won't be the last; as long as consumers use search engines to find the things that they want SEO will continue to be abused and manipulated by those with less scruples. All we can do now is what we have always done (only better!). We will continue to lead our clients through the digital landscape and in doing so help them pursue their business goals, on the field, further. We'll continue to share the content of designers, writers and bloggers that matter and those people will be credited for what they do, but only so that you know who they are. For our clients we will continue to help them realise that they have the answers to the questions their customers seek, and that more-and-more they're asking them online. 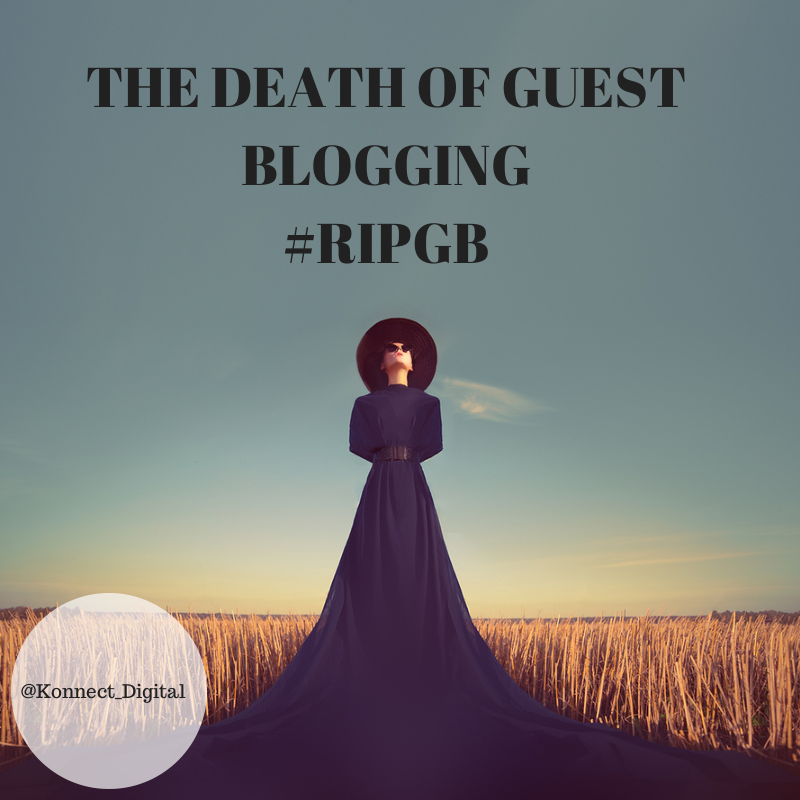 Guest blogging may be dead, but the art of sharing isn't. Let's just hope Google shows some discretion when it comes to penalising those who are doing the right thing. Have you genuinely used guest blogging; or are you a blogger who gets regularly pummelled with spam? Let us know.